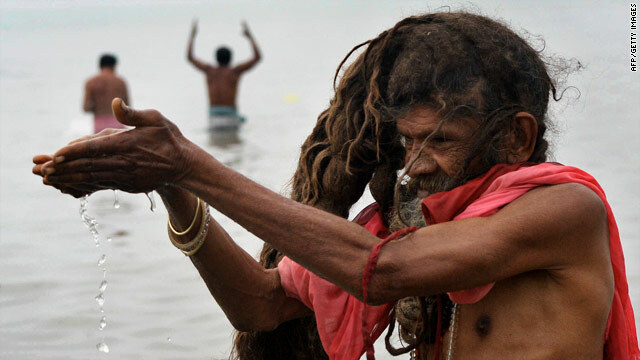 A holy man offers water to the Sun God during the "Gangasagar" where the river Ganges connects with the Bay of Bengal. New Delhi, India (CNN) -- Seven pilgrims were trampled to death in eastern India Thursday when they tried to board a ferry for a sacred island site, authorities said. The crush occurred at a jetty when pilgrims were heading for the Gangasagar island to take holy dips, said Khalil Ahmed, the most senior official of West Bengal state's South 24 Parganas district. There were six women and a child among the dead, Ahmed told CNN. Nine others were injured in the stampede, he said. Thursday is a key date on the Hindu religious calendar. In the meantime, hundreds of thousands of Hindus have swamped Haridwar in northern India for the weekslong Kumbh Mela, or the Pitcher Festival. The event is marked with a series of mass bathings in the Ganges -- one of India's most sacred but heavily polluted rivers -- in the belief that the act washes off sins.